Today we welcome Dr. and Mrs. Philip Ninan. Dr. Ninan and his wife, Sophy are going to India to plant churches. They are members of Independent Baptist Church in Bolingbrook IL with Pastor Dr. David Shoaf. We are excited to get to know this couple and trust that our church will be a blessing to them also. Please pray for two young mothers in our church who have cancer. Joanna Edwards and Lauren Higgins both have breast cancer and are taking treatments immediately. Both are taking Chemotherapy and then will have surgery; we want to stand by our church members in their time of need. PLEASE PRAY!! Our church is still realizing the great blessing of our Messenger’s Conference we held in January. 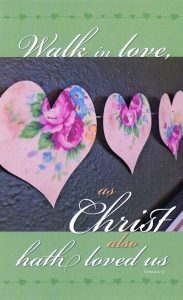 Dr. Andy Edward’s sermons are available on CD; if you want all 5 messages, please fill out an envelope with your name, mark on it Conference Messages and enclose $10.00. We will copy the messages and put your CDs on the back table in the lobby the following Sunday service.